The 2019 Hyundai Veloster Turbo updates the weird three-door front-wheel drive hatchback, pouring on even more stylish flourish over the first generation inside and out, and laying the groundwork for the upcoming even-hotter Veloster N.
The 2019 Hyundai Veloster is the second generation of the quirky three-door hatchback that serves as the flashy and fun counterpart to the mechanically similar Elantra GT. Hyundai claims the new Veloster, with the upcoming sportier 275 horsepower Veloster N hot hatch, is meant to serve as the brand’s halo car. Where other automakers have secret meetings in basements and produce mega-fast six-figure supercars, Hyundai hopes the new Veloster can pull in enthusiasm from the bottom of the pyramid, not the top. I have to imagine Hyundai sees the upcoming Veloster N as the actual brand halo car and not the whole model range, so we’ll have to wait just a few months to get our hands on that. As for the standard and Turbo Veloster, the performance isn’t quite halo car material, but like a Doritos Locos Taco, the Veloster is dusted in a lot more flavor over an otherwise already satisfying and competent package. The new standard Veloster will be available with an improved non-turbo engine option, which gets you 147 horsepower and 132 lb-ft of torque from a 2.0-liter four-cylinder. But I caught seat time in both the new Veloster Turbo R-Spec and the Veloster Turbo Ultimate, and just like all new Veloster Turbo models, they share the same 1.6-liter turbocharged inline-four cylinder from the outgoing Turbo model, with 201 HP and 195 lb-ft of torque. All Velosters can be equipped with a six-speed manual transmission. A six-speed automatic is available on non-turbo cars, and a seven-speed dual-clutch is available on the Turbo. You should also be aware that there’s only space for four butts, at that space is only accessible by three doors, with the rear passenger door located on the passenger side of the car (the door is engineered to be on the other side in appropriate markets). There’s also the rear hatchback opening if you’re flexible enough. Storage space behind the 60/40 rear seats is 19.9 cubic feet, which is more than a lot of competitors. The new Veloster keeps it weird, but thankfully the driving experience is not—though it’s also not all that unique. The outgoing car could never really be called genuinely sporty no matter what it looked like, and the new Turbo, numbers to pavement, doesn’t drive any sportier (which shouldn’t be a huge surprise, considering it’s the same engine and, I’m told, a similar weight). What is nice about the new Veloster Turbo is the handling, which feels tight and sticky, though the steering feel, at least on my short amount of driving time, seemed to lack strong steering feel and predictability. But I wouldn’t call the feedback bad. Handling is helped by the new Veloster’s upgraded suspension, with some new aluminum parts at the front and rear, and a new multi-link independent rear suspension. Overall, the tight twists of the Austin vineyard roads we tested were engaging and moderately challenging—to the point where my co-driver, [redacted], even got a little motion-sick, but that could also have been due to the extremely sweet french toast we had for breakfast—and the Veloster never once made me lose any confidence at speed. Inside, the wheel buttons and dashboard are intelligently laid out, with physical knobs and tabs for all of the common-use infotainment needs like radio and navigation. The available eight-inch display is notably sluggish to the touch, but far from the worst system out there. And it comes equipped with Android Auto and Apple CarPlay (standard on every car), which makes things infinitely better once connected. Also nice inside are the individual colors and seat materials on each trim level. The base 2.0 comes with royal blue accents and black cloth seats; the 2.0 premium with orange accents and a black cloth and leather combo; the Turbo R-Spec gets exciting yellow accents with two-tone cloth seats; and all other Turbo models get red accents and a different cloth and leather combo, except for the ultimate, which gets a two tone white and black interior design with white full-leather seating. Other good standard features include Driver Attention Alert, Lane Keep Assist, Forward-Collision Warning, automatic headlights and daytime running LEDs. Some of the available options also include a large heads-up display that’s clear to read and smart cruise control. Our Turbo Ultimate also had wireless phone charging. My favorite part about the new Veloster is the look of the Turbo Ultimate we drove. Ours was Racing Red, but the available Sunset Orange also enhances the look and attitude of the car extremely well. The soft Chalk White paint also looked pretty good if you’re trying to be more reserved, but that’s not what this car’s design is really meant for. I really like the aggressive front of the car, its roofline has been raked steeper towards the back of the car making it look faster, and the inverted fender flares are a nice way of adding dimension to the car without adding bulk. The best bit of design was down at the wheels, though, with the Turbo’s optional 18-inch cyclone-style two-tone metalwork that reminds me of my favorite Hot Wheels cars growing up. If I was buying this car, I’d be getting these. Oh, and 18-inch polished-black wheels with Michelin Pilot Sport 4 Summer Performance Tires are also available on the Turbo models. As much as I love the hot-sauce-packet-colored paintwork on the cars I got to test, I’m disappointed by the color options for the Veloster. Beyond orange and red, there’s black, light and dark grey, silver, and then the white which comes across, to my eyes, as an even-lighter grey. A Hyundai rep told me more colors could be introduced later, possibly as special editions. Every car comes with a red-highlighted trim piece under the grille, which I did like. This is the nice two-tone interior of the Turbo Ultimate, but everything south of the air vents is hard plastic on all models. A lot of the materials used on the interior of the Veloster, on all trims, were very disappointing. The greatest offense is the large, visibly nice but incredibly hard plastic piece that runs up the passenger side of the dashboard. It leaves the passenger with no comfortable place to rest their knee, especially if they’re taller. It was a problem even on the Turbo Ultimate, which is as optioned as you can get. None of the Velosters even get electric seat adjustments, and you can only roll down the three windows linked with the three doors, which could make wind buffeting an annoyance. Driving the Veloster was pleasant, but even Hyundai stops short of calling anything under the N model sporty. It’s stylistically aggressive, but the actual performance is only a very mild heat on the current Turbo cars. I think the problem is peak torque of 195 lb-ft kicking in at just 1,500 RPM, which Hyundai tries to sell as a positive since it gives you everything it’s got early, but it clashes with the presence of the six-speed manual. You get in thinking you’re going to enjoy revving through the gears with a nice gradual line of increasing power, or at least the feeling of it, but anything above second lacks a punch and the initial excitement of the torque quickly fades. Instead of sporty, Hyundai sells the Veloster Turbo as fun to drive. That’s not wrong, but a lot of the car’s presence is communicating a different experience. I came away really enjoying the car’s punk troublemaker appearance, accepting that its improved handling mostly made up for the lack of a revvy power delivery. Pricing starts at $18,500 for the manual non-turbo 2.0-liter, and the manual-only Turbo R-Spec starts at $22,900. At that price, I struggle to seriously complain about a lack of power, especially when those who crave a ridiculously punchy hatchback have the N to look forward to still. 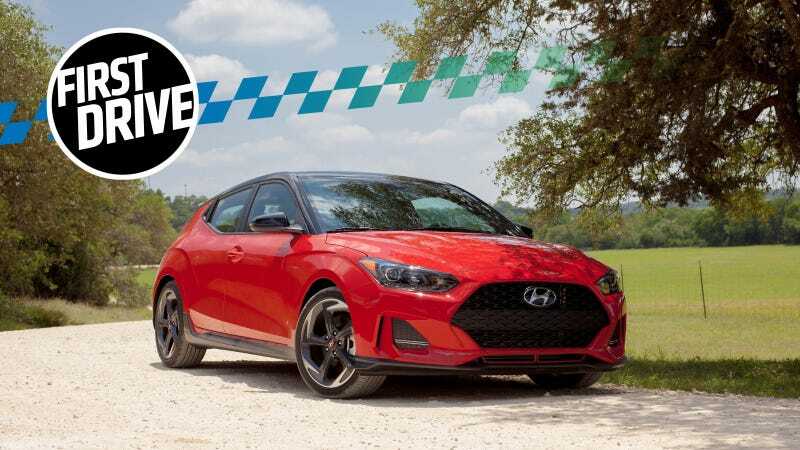 I would have loved the 2019 Hyundai Veloster Turbo R-Spec as my first car or while I was in college, and I think that’s probably exactly where the automaker is aiming with it. Get drivers while they’re young and still want to have fun, which is all a halo model should strive to do, really. This is the most-fun Elantra.